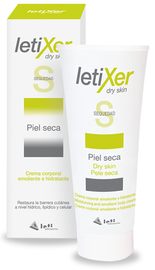 The LetiXer care range provides specific solutions for the different degrees of skin dryness, thanks to its three products formulated for dry skin, dry desquamative skin and for areas of extreme dryness. Specific smoothing, moisturizing and highly emollient kerato-regulating cream for the care of areas prone to calluses and extreme dryness. Body cream with extra-strength emollient and moisturizing properties, indicated for the specific care of dry skin (xerosis).